After the game that McCray won, his teammates went to a restaurant to celebrate but he didn’t join them – he knew he wouldn’t be served. TUCSON – The crowd stood and cheered. Someone handed Ernie McCray the basketball. When the Arizona Wildcats hosted Los Angeles State at Bear Down Gym on Feb. 6, 1960, there was no scoreboard to show how many points each player had scored. No public way to document the smashing of records and preconceptions and prejudice. The 6-foot-6 senior from Tucson High School scored 46 points – a UA record to this day. Afterward, his teammates went to a restaurant to celebrate. McCray didn’t join them – he knew he wouldn’t be served. McCray had childhood friends that, so disillusioned by racial hatred, overdosed on heroin before they could graduate from high school. Others, the ones that made it out, vowed never to return to Tucson. He smiles more than anyone in South Park, a trendy neighborhood of San Diego, but won’t forget what it felt like to confront racism growing up in Tucson. At 71, McCray has six children, nine grandchildren and eight great-grandchildren. His welcome mat today reads “Two Aging Hippies Live Here,” something his third wife, Nancy, insisted on buying before her death last year. After receiving a master’s degree from the UA in 1962, he taught in San Diego for 37 years before retiring. He dunked basketballs during outdoor assemblies to get students’ attention. He still carries a Tucson High book bag. He acts in plays, feeling the same butterflies that used to accompany tipoff. Performing has always been his stress reliever. That day 50 years and eight days ago, however, McCray couldn’t take the pressure. His marriage to “Sweet,” a high school sweetheart, was crumbling. At 21, McCray already had three children to feed. Trips to the UA’s job-placement office landed him gigs as a janitor at Sears and a lifeguard for city pools. On the side, he worked pool parties for the mob, whose members liked the way he related to the children. They’d slip him an extra $20 – good for at least a month of groceries. Sometimes, though, he didn’t want to go home. On Feb. 6, 1960, he didn’t. In the afternoon, he and a buddy began drinking Thunderbird, a cheap fortified wine. He wasn’t drunk when the game started – just concerned about whether he smelled like booze. He inhaled when teammates walked past. 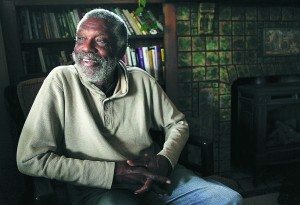 McCray and his boyhood friends spent their summer days at Laurence Dunbar Elementary and Junior High, the black school in segregated Tucson, playing sports. “I don’t remember ever not being fascinated by a ball,” he said. McCray, who went by the first name “Charles” until high school, was enthralled by seemingly everything. He and Shirley Robinson-Sprinkles, now a Texas-based doctor, were “quiz kids” who competed for Dunbar in radio broadcasts. He loved the annual school trip to the symphony. He even liked country music, figuring Tucson would be hell if you didn’t. His mother, Mary – a church musician – took him to operas and ballets and symphonies at the UA campus. They were constants in the fine arts department, like paintbrushes. “I was always fascinated by the timpani drums,” he said. A Howard University graduate, Mary McCray moved to Tucson after contracting tuberculosis; here, she met Ernest “Mac” McCray, who played boogie-woogie piano at dusty bars. Ask Ernie about his father, and he tells a story about “Mac” walking down the street, slowly coming into focus, before slipping his son a few bucks and evaporating again. Mary, who worked as a janitor at the phone company for years before landing a technical job there, insisted her son debate politics and art at home. Black entertainers weren’t allowed to stay in Tucson hotels, so they would move in with prominent black residents. From their duplex near 10th Avenue and Second Street, Ernie remembers seeing Count Basie or Joe Louis or Satchel Paige walk down the street. The summer he was 9, McCray and a friend went to the same café every day, hoping to buy an ice cream. The owner relented, finally, fishing two cottage cheese containers out of the garbage and filling them up. The boys whipped them at the owner and ran. McCray once told his maternal grandfather he hated white people. The old man reminded McCray of the fellow at Cut-Rate Drug Store who gave him extra ice cream in his root beer float, the Safeway worker who gave him an extra piece of fruit, or the woman at the library who would introduce him as her smart friend. It wasn’t always that simple. When McCray became a star at Tucson High, he made white friends. Inspiring story, I grew up in Phoenix 5 years older than Ernie. I met my first black person when I was drafted into the Army in 1953. His name was Billy Taplin he was from Alabama. I remember when I was in Roosevelt School in South Phoenix, I lived on South 7th Street. All the black people lived on East Broadway but no blacks went to Roosevelt. In High School I went to Phoenix Union, the black kids went to Carver High. Man, do you ever bring back some memories. I remember those days well. My Tucson High team lost to Phoenix Union in the state championship games of ’55 and ’56. That was at the beginning of the era when black kids went to schools other than Carver. Phoenix Union then, as Carver had been, was absolutely unbelievable in sports. Every starter of their ’56 championship team went on to successful careers at the next level. My good friend, and nemesis throughout high school and college, Albert Nealey, went on to become one of Arizona State University’s all-time greats. Darnell Haney was All-Coast Guard for years when the military had great special service teams. Stretch Holmes was All-Everything at Weber State. Jon Conner was my teammate at Arizona, a good passing guard and floor leader. Ken Ramsey played freshman ball with us then went into the military. I bet you remember East Lake Park where the “games” were. I would get up there from Tucson every chance I got. Do the names Hadie Redd and George Greathouse register in your memory? Anyway, Dave, thanks for bringing up some history I can really relate to. Thanks Ernie, oh I do remember the name George Greathouse, never knew him myself. Yes East Lake Park was on 16th Street and Jefferson I think. My brother who is 5 years younger than me, was in the first integrated PUHS classes, then we moved while I was in Korea, and he graduated from Camelback High. I am a old ZONIE and we had a beach house in MB, I did not even know OB was here in the 40’s and 50’s. Now it is my last home town. Back then I could not wait to get back to Phoenix and my friends. It was a two story apartment on Deal Court, My dad sold it when all us kids went out way. Please don’t tell me what it is worth now. You definitely would not want to know what it’s worth now. The news would be crushing. There’s so much history in Arizona when it comes to black people. There were towns when I was growing up where blacks couldn’t buy gas. That was something that was very hard for me to wrap my young mind around. It seemed to me that if you hated a group of people that much, you sure wouldn’t want them hanging around in your town because they couldn’t buy gas to scram. But who ever said that hateful minds indulged in logic, huh? Anyway, Phoenix, like my hometown, has come a long way.